The Old Testament regularly sounds this theme, especially in what we call the wisdom literature (e.g. Job 27:3; 33:4; 34:14-15; Ps. 104:29-30). God upholds the creation through his Spirit. Even the natural processes of everyday life on our planet are credited by Jesus to the direct agency of his Father when he speaks of his Father providing sunshine and rain, feeding the birds and providing the beauty of the flowers (Matt. 5:45; 6:25-30; 10:29-30). Extreme forms of immanence lead to pantheism, the belief that every creature is not only a manifestation of God, but is identical with God. A similar problem, and one that became more popular in the last century, is panentheism. Panentheism literally means “all-in-God” and posits the idea of God as an eternally animating force that interpenetrates every part of nature and yet timelessly extends beyond it. Unlike pantheism this thinking about God maintains a better Creator-creation distinction but it tends toward believing that the cosmos exists within God, thus it denies, in some way at least, the creation-Creator distinction required by a proper emphasis upon transcendence. The simple way to say this is to affirm that God is both distant (transcendent) and near (immanent). He really is actively present and working in all things (cf. Romans 8:28-30). Yet he is “beyond” our universe. This means that we should always conceive of God as very near while we should never put him inside the world in such a way that he does not remain exalted over it and outside of it! The vast majority of people who have ever lived have claimed some kind of belief in sacred mystery – God. It is sometimes argued, by modern secular writers, that the reason for this belief is that all pre-moderns were taught to think this way and people have simply found their beliefs confirmed by life experience. The conviction of the reality of God, or sometimes of multiplicity of gods as in Hinduism, is a common human characteristic it seems. Even moderns still believe in higher numbers than some would have us to believe. Throughout history a basic trait of all cultures has been a belief in divine transcendence. 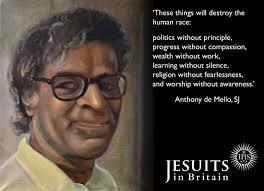 Anthony de Mello expressed what I am trying to say by telling a simple Hindu story of what truly seeing the power of nature meant. “Oh, this? But this is water. What I’m seeking is the ocean,” said the disappointed fishy as he swam away to search elsewhere (Anthony de Mello, The Song of the Bird (Garden City, NY: Doubleday and Company, 1982, 12). If you pressed the Hindu storyteller to explain the moral of this story he would likely say the disappointed fish must come to know that he is not to look for something. Instead, he must look at the reality that is constantly surrounding him. This is how it is with our search for God. This is what Paul meant when he quoted ancient pagan poets who said: “For in him we live and move and have our being” (Acts 17:28). God is a vast ocean and we cannot explain him so much as can simply knowing that he is and wonder.